Fried chicken is about as American as apple pie. And in Kentucky, we take it very seriously. 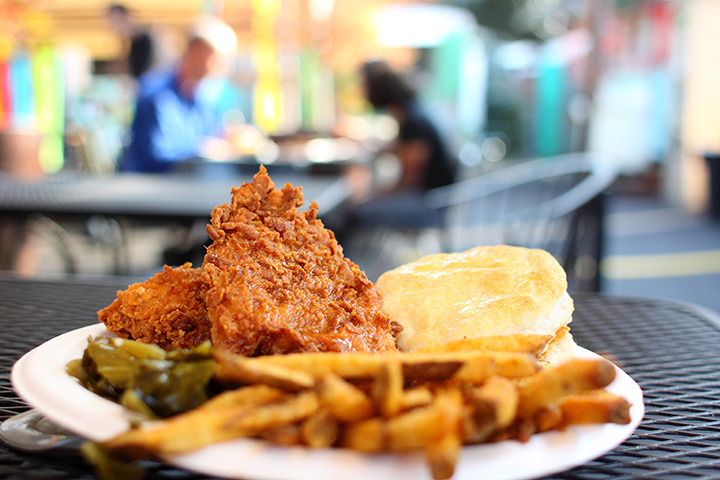 From Louisville to Lexington, Kentucky has some formidable forces on the fried chicken scene. Pair your crispy fried chicken with mashed potatoes, banana pudding, and a butterscotch milkshake, and you’ve got yourself a delicious meal. Here are the best places for fried chicken in Kentucky. You’ll be in for pleasant surprises when you visit Royals Hot Chicken in Louisville. This isn’t your typical fried chicken place with a menu that includes crispy fried chicken and sauces that range from no heat to gonzo madness. To make things interesting, you can also order kale salad, southern fried tofu, shells and beer cheese, sweet potato and marshmallow pie, and a royal shake with a Bourbon shooter thrown in for good measure. Joella’s knows how to do chicken all kinds of ways. From crispy old-fashioned fried to adding waffles, pimento, a lettuce wedge, or kale, if you love chicken, you’re bound to find it your way at Joella’s Hot Chicken in Lexington. And if you love the taste of chicken, but don’t eat meat, there’s fried “chicken” just for you made from a soy-based pea, carrot, beetroot, and potato recipe that will blow your mind. Great service and great food keeps folks coming back year after year to Our Best. Located in Smithfield, this no-frills restaurant only offers the best in Southern cooking from fried green tomatoes to old-fashioned bean soup to country ham and the best fried chicken west of the Mason-Dixon line. Family style and proud of it. Don’t let the small size fool you. Cliffside Diner in Frankfort is small on size, but big on customer service and great food. You’ll also meet some of the nicest people around. Daily specials are offered every day in a cool atmosphere that’s modeled after the 1950s. Get your burger fixed your way or crispy fried chicken with mashed potatoes and gravy. And you really can have your cake and ice cream, too. Put Tuesday on your calendar because that’s fried chicken night at the Greyhound Tavern, an historic destination diner in Fort Mitchell, Kentucky. The restaurant has been around since 1921 and a lot has changed, but they’re still winning awards for their world-famous fried chicken. This is Southern food fixed with Northern Kentucky style. Listed as one of the places to put on your bucket list, Bangie’s Café in Henderson is the place to go for breakfast all day. People come from all over to sample the plate lunches with specials like homemade goulash, chicken pot pie, and fried chicken that’s made with a special recipe that will make your mouth do a happy dance. Beaumont Inn is a gorgeous colonial bed and breakfast located in Harrodsburg that’s has been named one of the most charming B&Bs by Southern Living Magazine. They serve the famous yellow-legged fried chicken, country ham that’s been cured for two years, and a golden corn pudding that’s the talk of the town like grandma used to make. Considered a fast food chicken joint by the locals, Joe’s Drive Inn & Chicken is THE place to get some of the best southern fried chicken in the area. Team that up with a butterscotch milkshake and some coleslaw and you have a winning combination every time. Open for lunch and dinner, make sure you get enough to take home. You might not expect a bakery to make a great chicken sandwich, but Kirchhoff’s Bakery in Paducah is about to change your mind. This little bake shop and deli with talented food artisans serves breads and pastries with a nice selection of sandwiches and salads each week. Don’t leave without trying the blackened chicken breast sandwich for a special treat. You won’t find a more traditional and down-home place to eat than Windy Hollow Restaurant. Located in Owensboro, it’s like taking a trip home when you taste their traditional biscuits and gravy for breakfast or the fried chicken dinner with mashed potatoes and gravy, complete with homemade banana pudding. This is stick-to-your-ribs cooking steeped in southern goodness.